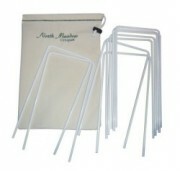 These premium square powder-coated steel hoops measure 5 x 11 x 1/4 inches. This set includes a wicket bag for storage and a rule booklet. Made in the USA. Also available is the Scottsdale 6 Player version. These sets are designed for non-tournament Nine Wicket Croquet. Turned from northern hardwoods, finished with a clear coat and striped in six or four colors. We offer premium 24 inch stakes. Made by our own fabric department, our North Meadow Wicket Bags are made with a heavy 100% cotton fabric. 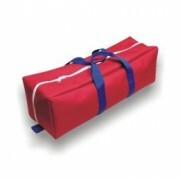 This storage sack is a convenient way to store your wickets within the croquet bag or box. Made with a heavy polyester fabric(duck cloth) our croquet bags were designed and made for The North Meadow Croquet sets with 32 inch mallets. This means you will NOT have to dismantle the mallets when you place them in the bag! Made with a heavy polyester fabric(duck cloth) our croquet bags were designed and made for The North Meadow Croquet sets with 24 inch mallets. This means you will NOT have to dismantle the mallets when you place them in the bag! Wood storage box for our North Meadow Croquet sets. 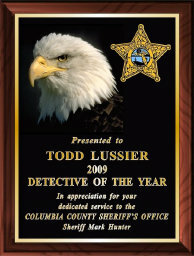 Measures 37" x 11" x 7" outside using .750" thick laminated wood. Measuring 31 inches long and turned from Maple. These sets are designed for non-tournament Nine Wicket Croquet. Made right here in New England our North Meadow Croquet balls are made of homopolymer polypropylene or more commonly referred to as poly or plastic. Complete set of six color balls measuring 35/16 inches in diameter. Weighing in at 10 ounces they are for Class D non-tournament Nine Wicket Croquet use.